John G. McKnight was born in Seattle, Washington. He received his BS in Electrical Engineering from Stanford University in 1952, and worked for Ampex Corp from 1952 thru 1972, except for the years 1953...1956 when he served in the US Army, at the Armed Forces Radio Service (AFRS) in New York City, where he also worked at the Gotham Recording studio. At Ampex, he served in the magnetic recording research group, the stereo tape division, and the professional audio division. In addition to research he also worked on the design of the CinemaScope reproducer system; the Models 350, PR-10, and MR-70; improvements in the high-speed duplication system and operating procedures at the Ampex Music (Stereo Tape) Division; and developed the "Ampex Master Equalization" (AME). He has published over 70 technical papers mostly in the Journal of the Audio Engineering Society (AES), on the theory and practice of magnetic recording, and on audio engineering. He received the Audio Engineering Society's Publication Award in 1982. From 1972 to 1974 he was also a consultant to Scully/Metrotech in Mountain View, CA, and to MCI in Ft. Lauderdale, FL, on audio systems and magnetic recording. In 1973 and 1974 he was a member of Judge Sirica's "Advisory Panel on White House Tapes" (“The Watergate Tapes”), and in 1977...79 a member of the Committee on Evaluation of Sound Spectrograms of the United States National Academy of Sciences. 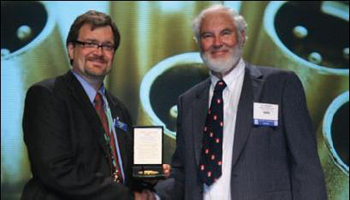 Bob Moses (left) giving McKnight (right) the Audio Engineering Society Distinguished Service Medal Award for 2008 - Photo courtesy of John G. Mcknight. Ampex Master Equalization (AME). Courtesy of Jay McKnight and Magnetic Reference Laboratory, Inc..
Azimuth in a Magnetic Tape Recorder. Courtesy of Jay McKnight and Magnetic Reference Laboratory, Inc..
Biasing in Magnetic Tape Recording. Courtesy of Jay McKnight and Ampex Corporation. Demagnetizing A Tape Recorder. Courtesy of Jay McKnight and Magnetic Reference Laboratory, Inc.
Field Strength for Partial Erasure of Magnetic Tape. Courtesy of Jay McKnight and Scully /Metrotech Div. of Dictaphone Corp..
Flux and Flux-Frequency Measurements and Standardization in Magnetic Recording. Courtesy of Jay McKnight. Head Height Alignment Methods. Courtesy of Jay McKnight and Magnetic Reference Laboratory, Inc.
Is My Calibration Tape Still Accurate?. Courtesy of Jay McKnight and Magnetic Reference Laboratory, Inc.
Low-Frequency Response Calibration of a Multitrack Magnetic Tape Recording and Reproducing System. Courtesy of Jay McKnight and Magnetic Reference Laboratory, Inc.
Master-tape Equalization Revisited. Courtesy of Jay McKnight and Peter F. Hillee of Ampex Corporation. Proposed Equalization For 15 in/s Studio Master Recording on High-output Low-noise Tapes. Courtesy of Jay McKnight and Trevor Kendall Scully/Metrotech Div of Dictaphone. The Unpredictable Joys of Analog Recording. Courtesy of Jay McKnight and Jack Endino.. Speed, Pitch, and Timing Errors in Tape Recording and Reproducing. Courtesy of Jay McKnight. Standard Tape Flux vs Frequency. Courtesy of Jay McKnight of Magnetic Reference Laboratory. Tape Recording Equalization Fundamentals and 15 in/s Equalizations. Courtesy of Jay McKnight of Magnetic Reference Laboratory. Tape Binder Shedding. Courtesy of Jay McKnight of Magnetic Reference Laboratory. Tape Coating Thickness, Retentivity, and Remanence Summary. Courtesy of Jay McKnight of Magnetic Reference Laboratory. Tape Reproducer Response Measurements With a Reproducer Test Tape. Courtesy of Jay McKnight and Ampex Corporation. Write about John G. McKnight! Do you have content or pictures, to add, of John G. McKnight? Do you just want to say "Hello!"? Please feel free to Share it, here!